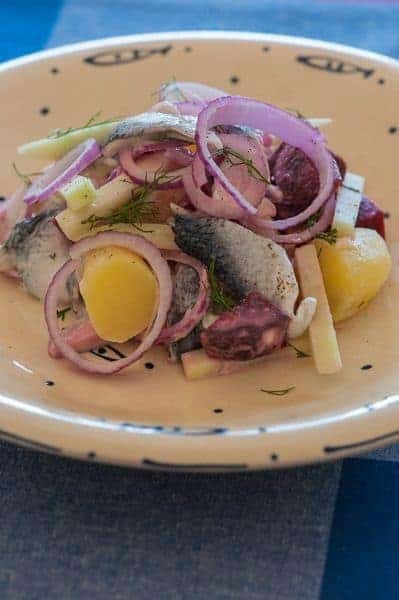 Delicious and healthy fish dish: herring and beetroot salad. Perfect as lunch or dinner! Cook the potatoes in a pan with water and salt, but do not overcook them. They have to stay firm for the salad. Rinse the potatoes under running water to stop the cooking process. Chop the cooked potatoes roughly and put them in a bowl. For the dressing, mix the horseradish cream with the sour cream (in a small bowl). Drain the pickled herrings, but save the liquid (use a sieve / bowl for this). Add 0,5 tablespoons of the pickled herrings' liquid to the dressing. Mix again and season with pepper and add the lemon juice. Cut the herring diagonal into 3 cm stripes. Cut the beetroot, apple and red onion in slices. Chop the dill. Mix 80% of the ingredients with the dressing and save the rest for garnish. Season with salt and pepper. Put the herring salad on a plate and garnish with the rest of the ingredients. Enjoy!